A number of top intelligence community officials gathered at Thursday's White House briefing to discuss U.S. efforts going forward to combat election interference attempts. 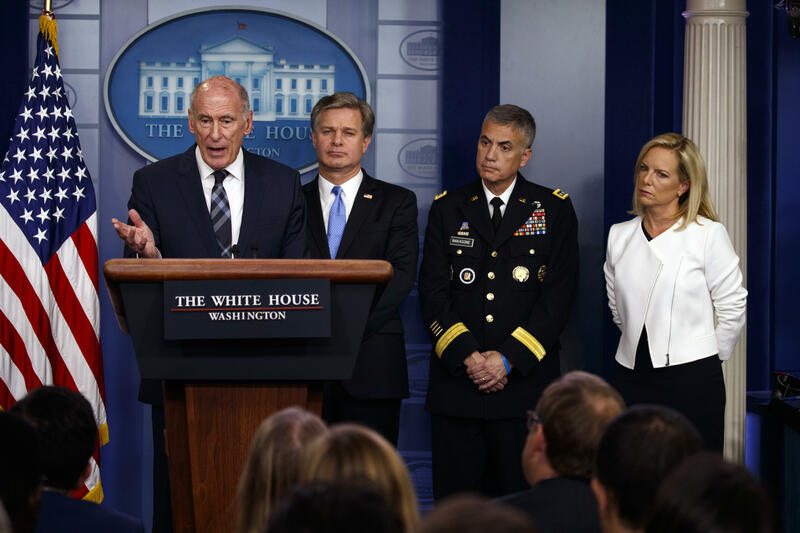 White House press secretary Sarah Huckabee Sanders was joined by FBI Director Christopher Wray, Director of Homeland Security Kirstjen Nielsen, Director of National Intelligence Dan Coats, National Security Advisor John Bolton, and National Security Agency Director Gen. Paul Nakasone. The briefing came after a Senate intelligence hearing Tuesday in which key officials criticized the Trump administration for not taking foreign election threats more seriously. Each intelligence official opened with a statement on what their agency is doing ahead of the 2018 midterm elections while also cautioning that election meddling efforts are real and pervasive. Nielsen said that "our democracy is in the crosshairs." Ahead of the briefing on Thursday, Bolton also sent a letter to Democratic Senators outlining how the Trump Administration is taking action to ensure election integrity. "I think the president has made it abundantly clear to everybody who has responsibility in this area that he cares deeply about it and that he expects them to do their jobs to their fullest ability, and that he supports them fully," Bolton said in the briefing. Coats, who fielded most of the reporter questions following each official's opening statement, said that while the U.S. is just "one keyboard click away" from encountering a previously unidentified means of Russian meddling, there appears to be a lesser effort ahead of the 2018 midterm elections than there was in 2016. "Relative to what we have seen for the midterm elections, it is not the kind of robust campaign that we assessed in the 2016 election," Coats said. "We know that, through decades, Russia had tried to use its propaganda and methods to sew discord in America. However, they stepped up their game big time in 2016. We have not seen that kind of robust effort from them so far." Coats said the current efforts do not appear to target one specific party, but mentioned that the U.S. is aware of actors other than Russia with meddling capabilities and who considered attacking. "The Russians are looking for every opportunity regardless of party, regardless of whether or not it applies to the election, to continue their pervasive efforts to undermine our fundamental values," he said. Wray said the FBI has not yet seen foreign attempts at interfering with election infrastructure for the midterms, but that divisive information is being spread from overseas. The meeting of high-ranking Trump officials comes weeks after President Trump's meeting with Russian President Vladimir Putin at the Helsinki summit in June. During a joint press conference with Putin, Mr. Trump said "I don't see any reason why it would be Russia" while addressing a question about Russian meddling in the 2016 U.S. presidential election. However, Mr. Trump later backtracked and clarified that he meant "I don't see any reason why I wouldn't," have been Russia, which is more in line with the findings of the intelligence community and other investigations.